← Why Is My Water Reddish? There are new recycling processes starting in Ann Arbor in July. Go to this website to learn about it. Here is some of the info copied directly from the site. Be sure to check the City of Ann Arbor site for changes. The City of Ann Arbor is reconfiguring its recycling plant to accept an expanded range of materials from residents, schools, and businesses. The city is also partnering with RecycleBank to provide rewards and incentives to households that recycle. What is single-stream recycling? Single stream recycling allows residents and businesses to put all their recyclable materials in one convenient wheeled recycling cart. No recyclables will be collected outside the recycling carts. Trash will still be put in a separate cart. The attached video clip (created by RecycleBank) provides a generic overview of the process. What materials will not be accepted? Polystyrene foam (Styrofoam™), #3 (PVC) plastics, biodegradable/PLA plastics, and plastic bags will not be accepted. Ceramics, porcelain, batteries, used motor oil and oil filters will no longer be accepted. When will single-stream recycling begin in Ann Arbor? Single-stream recycling will begin on Monday, July 5, 2010 for residents and partipating businesses. On that date you will be able to recycle all the additional plastics and other materials mentioned above. The new recycle carts will not arrive immediately for everyone. Please continue to use your existing recycling stacking bins until you have received your new cart. You will be able to blend all the recyclable materials in your existing stacking bins effective July 5, 2010. Will I get a new recycling container? 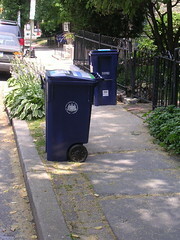 New, free recycling carts will be delivered to each residence over a 6-8 week period in July-August 2010 with approximately 1000 carts/day delivered along neighborhood routes. Businesses will be able to place all materials to be recycled in their current recycling carts and “papers only” recycling dumpsters. Apartment complexes will receive new or refurbished carts, depending on the age of the current containers.